Why does the “online” marketer have to do anything different from the “other” marketer at the beginning of a new year? The online marketer is blind without accurate data. The online marketer has wrested control from the grubby hands of IT. the seeds of holiday regret are planted in February procrastination. Don’t worry. We’ve prepared a list of seven things you should do now at the beginning of 2015. “If only” are the saddest two words in the English language. If only we had a little higher conversion rate from all of that juicy holiday traffic. If only our shopping cart had worked with Internet Explorer. We know that the holidays are happier when we get more revenue under the Christmas Tree. This year let’s start getting more from the traffic we’re going to get next November and December. Testing and optimizing does take time. Now is the time to start testing if you want your holidays to be merrier. The modern marketer has taken control of much of the website from the grubby hands of IT and the web developers. Today, tag managers give marketers an unparalleled ability to add measurements to a site without IT’s help. Split testing tools allow them to transform a website for a particular group of visitors at will. Many marketing departments should adopt the best security practices of their IT brethren. If a malicious individual got the password to Optimizely or Visual Website Optimizer, they could wreak havoc on the site at will. Go ahead, change your passwords. And make them good passwords. We use the program PassPack to store and share hard-to-crack passwords with our team. A website is a complex piece of software. New pages are added by different stakeholders. Changes are often undocumented. Not everyone is concerned that your analytics and testing tools need to be added to each page and then checked. Before diving into a new year, run through the pages on your site and make sure they all have the right tools installed. There are automated systems for checking your site, but taking some time to explore by hand is very helpful. Get ready to start a punch list. I recommend installing two browser extensions for Chrome: Tag Assistant by Google and Ghostery. Tag Assistant tells you if your Google Analytics or Google Tag Manager installation is broken on any page, and offers helpful tips. Ghosterytells you every tag that is installed on the page, so you can check for things likeClick Tracking tools, session-recording tools and more. Consider moving to a tag manager, like Google Tag Manager. This centralizes analytics setup. Your analytics will tell you which browsers and devices your visitors are using on your site. 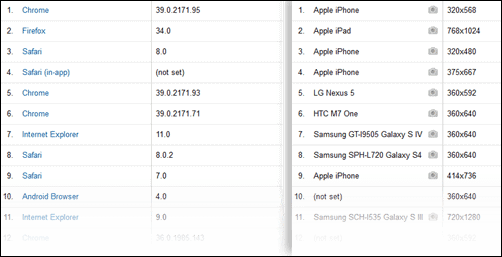 Your analytics will tell you which browsers and devices to check. Make sure your site works on the top devices and browsers. The end of a year means another year of data. Woohoo! This means we have an entire year to compare our progress against. When we compare year-over-year data, we eliminate differences that occurred due to market changes. For an online consumer retailer, comparing October performance to November performance wouldn’t be fair, since the holiday shopping season starts in November. Instead it’s better to compare October of this year to October of last year. Here are some of the things we like to look at in our year-over-year data. It’s the off-season that kills us. It’s the winter months for bikini boutiques and the summer months for mitten makers. However, if we are making progress on our site, we should see less of a drop revenue during the off-peak weeks. And with shallow troughs we often see higher spikes during prime selling or lead-gen seasons. Even it you got more traffic to your website in 2014, you may not see the increase in revenue. By measuring the Revenue per Visit (RPV) and Conversion Rate (for lead generation) you can see how your efforts in 2014 added to the bottom line independent of traffic volume. When people buy from you, are they buying more or less? This is what average order value tells us. 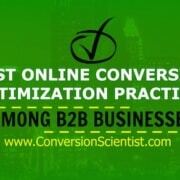 Even if your traffic was flat and your conversion rate didn’t move, you may be getting more from each customer. If you saw an increase in traffic to the site, did you see an increase in bounce rate? The Bounce Rate measures visitors who came and didn’t stay long. They saw only one page or left before 15 seconds had passed. Bounce rate is an indicator of traffic quality. 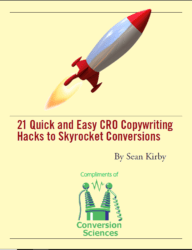 If lots of visitors are bouncing, then you may not be bringing the right visitor to the site. 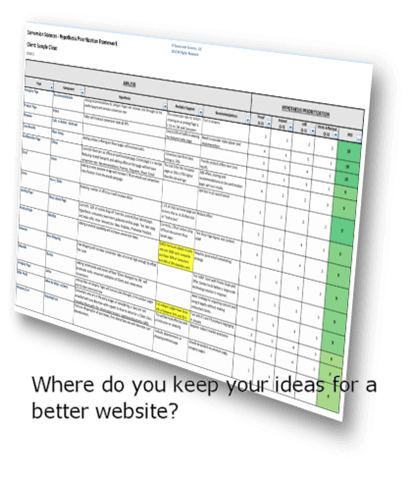 Where do you keep your punch list of things to try on the site? Go find it and give it a look. You’ll find some great ideas you forgot about. 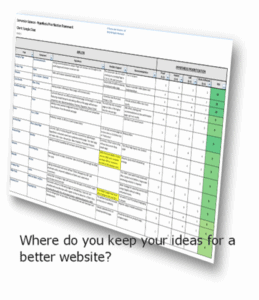 Where do you keep your ideas for a better website?